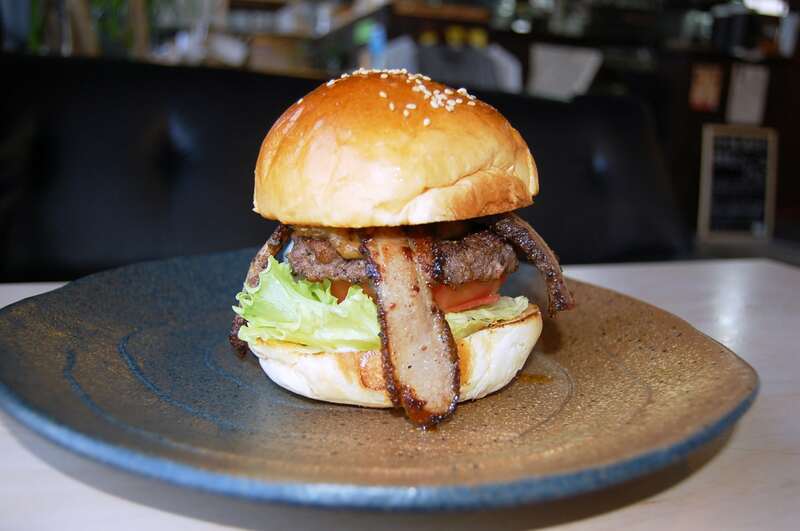 Editor’s Note: The Annual Okinawa Burger Festival is held every fall in late November or early December depending on weather. At the time of publication of this article in 2014, the event is scheduled for December 14, 2014. If you know the date for 2015, 2016, etc. please let us know in the comments and we will update this post! The reigning champion is the “ToTo La BeBe Special,” which took top honors in 2013, and also happens to be my favorite so far. In 2013, the inaugural year of the festival, the town was expecting 4,000 visitors and was pleasantly surprised by more than 7,000 people showing up. Because of the massive popularity the venue was moved to the Nou-Son Park, which also houses Ginoza stadium and has much larger facilities. There are no tickets or entrance fees for this event. The way things work at the festival is you visit the vendor of choice which will either sell you a whole or half burger. The latter size will come in handy if you want to sample several proprietors’ burger creations. When you receive your burger or half burger you will also be given a marble. If you deem the sandwich worthy, you put the marble in the jar with the label of the corresponding food vendor. At the end of the day, the establishment with the most marbles wins. Parking can be found at the Ginoza Stadium, Ginoza Dome, village offices, or via a shuttle at Ginoza Flea and Farmer’s Market. If you are missing your Five Guys, Fuddrucker’s or In and Out fix then you have no excuse for missing this extravaganza of meat, cheese, bacon, and bun goodness. Directions: The Burger Fest is just north of the Okinawa Expressway 9 Exit. Just look for the signs for the stadium on Route 329. Great idea, not sure about actual execution…since in it’s infancy. Only saw 6 vendor tents for the actual competition, and even the smallest of the lines had easily 40, 50, 60 people in it (and only 30 minutes into it nonetheless). Park-where-you-can worked well though and the classic car show was nice eye candy.